The concept of coordinative unsaturation can be confusing for the student of organometallic chemistry, but recognizing open coordination sites in OM complexes is a critical skill. Let’s begin with a famous example of coordinative unsaturation from organic chemistry. An analogy from organic chemistry. The reactivity of the carbene flows from its open coordination site. Carbenes are both nucleophilic and electrophilic, but the essence of their electrophilicity comes from the fact that they don’t have their fair share of electrons (8). They have not been saturated with electrons—carbenes want more! 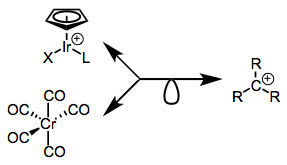 To achieve saturation, carbenes may inherit a pair of electrons from a σ bond (σ-bond insertion), π bond (cyclopropanation), or lone pair (ylide formation). 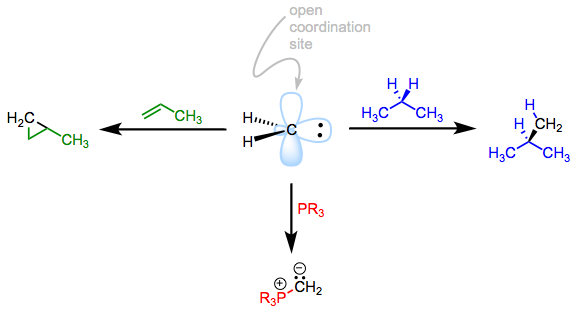 Notice that, simply by spotting coordinative unsaturation, we’ve been able to fully describe the carbene’s reactivity! We can do the same with organometallic complexes—open coordination sites suggest specific reactivity patterns. That’s why understanding coordinative unsaturation and recognizing its telltale sign (the open coordination site) are essential skills for the organometallic chemist. Coordinative unsaturation is not just the possession of a coordination number less than 6, or an apparent space in which a ligand might be able to approach. Sixteen or fewer total electrons on the metal center are a second necessity—just as, in the organic case, 6 or fewer electrons on the unsaturated atom are essential. Sixteen or fewer total electrons and coordination number less than 6 add up to a more fundamental synonym for an open coordination site: an empty metal-centered orbital! The lesson here is that we can’t just look to the geometry of a complex to determine whether it bears an open coordination site—electron counting is essential too. Like carbenes and carbocations, metal complexes containing open coordination sites don’t just hang around. They react rapidly with all kinds of electron sources. Furthermore, you won’t see them in stable starting materials or products. Thus, recognizing when a complex has the potential for an open site is important. What are some structural signs that point to the possibility of an open coordination site? Ligand dissociation from an 18-electron complex produces an open coordination site. Solvent ligands and side-on σ ligands—both of which bind relatively weakly to metals—often engage in this process. Try counting electrons in the two pairs of cationic iridium complexes below. Dissociation of weakly bound ligands reveals open coordination sites. Dissociation of a π-system ligand may also reveal an open coordination site. In this category, we might file away photochemical and amine-oxide-mediated dissociations of CO. Conditions like these encourage the loss of a ligand and subsequent replacement with something else, àla SN1 substitution. Reductive elimination is the open coordination site’s dream come true: two (sites) for the price of one (step)! Factors affecting the favorability of reductive elimination are beyond the scope of this post, but we can mention a couple here: steric crowding and an electron-poor metal. Finally, it’s important to note that open coordination sites often show up in fragments of OM complexes examined for one reason or another. We can relate these fragments to organic or main-group intermediates using isolobal analogies, powerful conceptual tools that we’ll explore in detail in another post. For example, the fragment (CO)5Cr is isolobal with the organic carbocation—the two sets of frontier MOs are analogous, and both structures have an open coordination site. 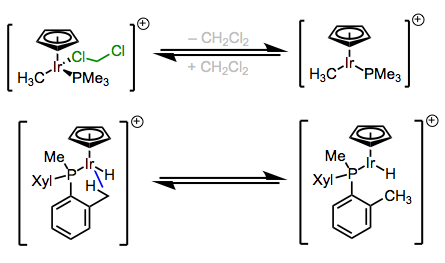 All three of these analogous fragments bear an open coordination site.